Ants are fascinating individuals. Miniscule but everywhere, they live lives that are completely alien to us, particularly their bizarre reproductive cycle. 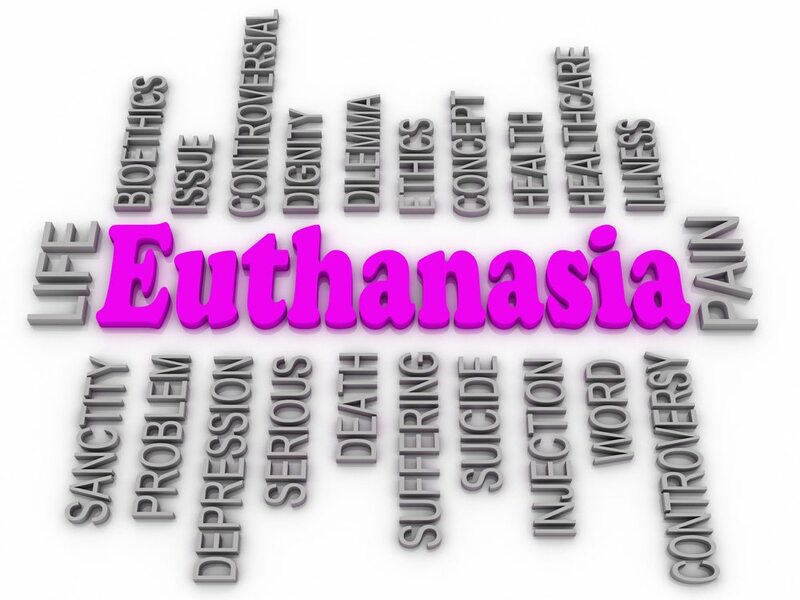 Nevertheless they can serve as both an example and an inspiration to humanity. Although each ant individually can do very little, they work closely as a cooperative society and together achieve great things. In fact they work so closely and successfully together that some people argue that ant colonies should be considered superorganisms as they cannot exist on their own. Ants are very closely related to other social insects such as bees and wasps and may have shared a common ancestor. To myrmecologists (those who study ants), they are one of the most fascinating of all living organisms alive today. Here we have listed just 10 of the most amazing facts about these wonderful little creatures. We hope you enjoy this intriguing list. It is often said that ants can carry up to 50 times their own body weight; this is equivalent to a human being lifting up a car! But the truth is we have probably been underreporting ant strength for many years. Weaver Ants have been reported as being able to support over 100 times their own weight while standing upside down! Quite a feat. More recently research has shown that the neck joint of the Common Field Ant can withstand up to 5,000 times their weight. This was established through the particularly gruesome method of putting ants in a centrifuge and increasing the force until their necks separated from their body. As a result it does not truly show how much weight the necks can carry (human astronauts can withstand significant G pressure for some time but could not carry the equivalent weight). 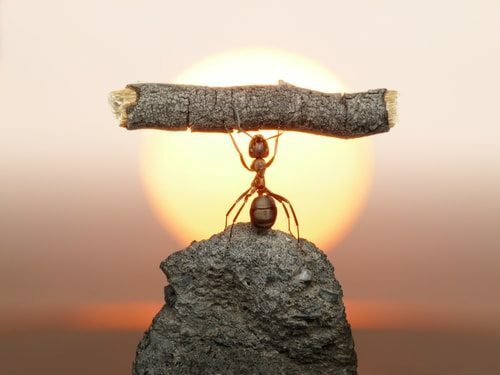 Nevertheless, the feats of strength of ants are truly impressive. One of the reasons for this super-strength is that the smaller the animal the more muscle strength they have to their body weight. 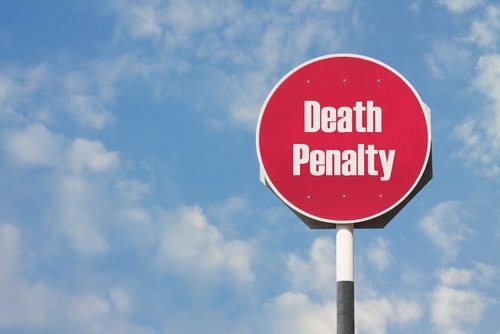 The aforementioned gruesome research has established that this super-strength might also be down to a design adaptation in the neck which is covered in microscopic bumps and ridges to help increase strength. Ants live symbiotically in nature. Ants have been around a long, long time (see below) and, over the period of their existence, they have had the opportunity to build mutually beneficial relationships with other species, particularly plants. The relationship between Pseudomuyrmex Ferrugineus ants and the acacia plant is a good example of this in action. The plant is responsible for providing nesting space (in its thorns) for the ants and food (nectar). In return the ants act as bodyguards protecting the plant from herbivores and keeping the plant healthy by attacking leaf pathogens. The acacia is not the only plant to benefit; other examples of such plants (called myrmecophytes) include the Nepenthes Bicalcarata, a carnivorous plant native to Borneo. 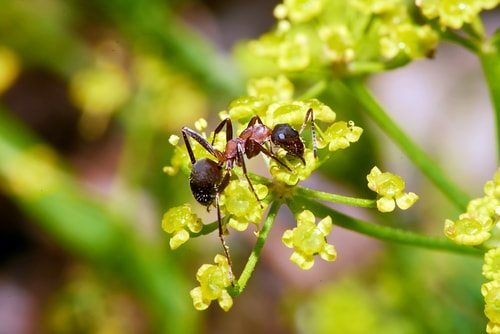 The plant gives a home and nectar to the ants who, in return clear (and eat) excess prey from the plant’s digestive chamber and provide extra nutrients in the form of their feces. Pretty Peonies also owe a lot to ants. While their flowers are in bud they secrete a type of nectar which has ants flocking to the bloom and helping to open out the petals. After the plant has opened up fully the ants will disappear. Not all plants are this civic minded, however, some don’t bother establishing a symbiotic relationship but act as parasites instead with the ant Pseudomyrmex Gracilis, which also lives on acacias being an excellent example. Plants infested with these selfish ants derive no benefit from the interaction; in fact their growth is often stunted. If we added up the weight of all the ants in the world and compared it to humans. About even. Ants are not a single species but a family of many (over 14,000) different species that share similarities so ants already have an advantage in a calculation of that nature (humans of all races are a single species). Ants may be tiny but there are huge numbers of them. It is estimated that there are at least a million for every living human! If you doubt this just go to a warm part of the world and put some sugar down. 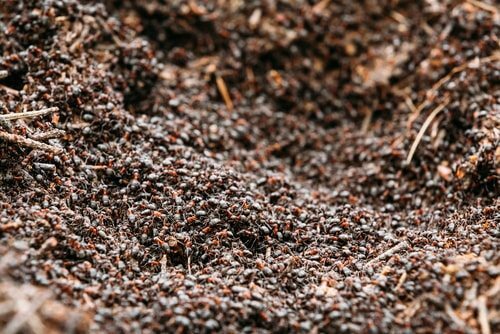 You may not think there are any around but in just a short time you will see thousands of ants flocking to collect the sugar. It can be almost impossible to count ants – most studies that do it have to cover a small area, spray it with insecticide and then count the bodies (a depressing and time-consuming way to complete a study) and extrapolating the results. Such studies have estimated that the weight of ants in tropical rainforests is greater than the weight of all vertebrates (animals with backbones) in the same area combined. Not only are there a great many ants, but they are found everywhere. They have colonized every corner of the world except Antarctica and once they get somewhere they grow, forming large colonies wherever they can. These numbers soon mount up to a weighty proposition. Ants have long been known to form symbiotic relationships (see above) but they are also known to herd and farm other insects. They are the only animals, other than humans, in which this capability has been seen. Ants farm animals of choice are aphids and mealy bugs. Ants gather together herds of these other insects on a plant and will move them about to ensure they are ‘grazing’ in the parts of the plant that produce the most sap. They protect them from predators, from the rain and will clip their wings or even drug them to prevent the aphids escaping. Why do the ants do this? The answer is that the aphids and other ‘farm insects’ are very efficient producers of honeydew or nectar. When the ants stroke the aphid they stimulate the production of honeydew which they can harvest for their own benefit. Some ants go even further than farming other species and force other ants to become their slaves. They can do this in one or two ways. Firstly a queen ant can invade another queen’s nest, kill her and force the workers to bring up her own eggs. Without their own queen to reproduce they will die out. Alternatively workers can enter another nest and steal larvae which they will then return to their own nest to raise as slaves. Slavemaking ants are so lazy that they have been known to starve to death without their slaves to do the work for them, even when there is an abundance of food and if they move colonies they will be carried by their slaves. Typically such ant societies will have 2 slaves to every one slavemaker. 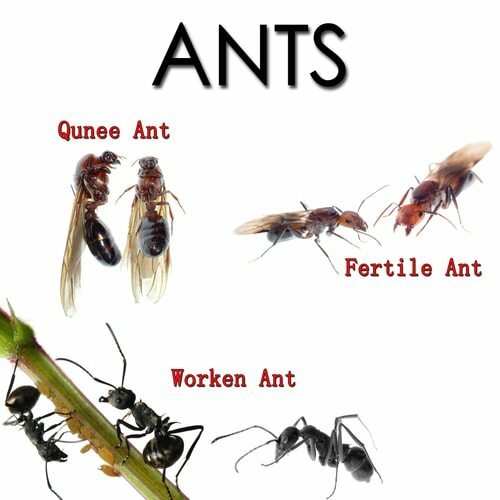 Some ants have specialized as agriculturalists and farm fungi which they cultivate and grow in order to eat the ‘fruits’ the fungus produces. Along with bark beetles, termites and humans, ants are one of only 4 species that practice agriculture and they developed it at some point in the last 50,000 years which put the antiquity of similar human achievements in the shade! Humans have been studying ant fossils since about 1792 but for many years thought that Ants did not evolve until about 40 million years ago. In 1965, however, amber deposits were unearthed in New Jersey that would change our understanding of ant evolution. Two ants were found that dated back to 92 Million Years BC. One of the ant species, Sphercomyrma Freyi is now extinct and shared many similarities with wasps although it was known to have separate queens and workers and to have a metapleural gland which is a defining feature of all ants. A more modern ant was found in amber at the same location. A Ponerinae Ant, it was a direct relation to ants of a family that still exist in the tropics today. 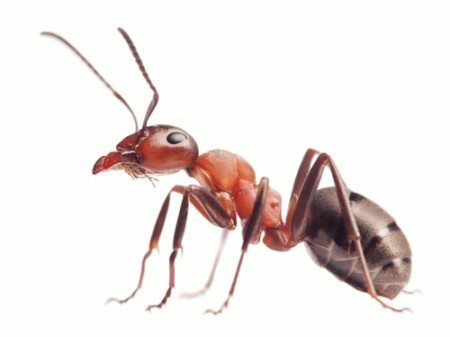 In order for such a modern ant to exist 92 million years ago researchers believe that primitive ants must have existed as early as 130 Million years ago and that they lived and evolved alongside famous Cretaceous dinosaurs such as the Spinosaurus, Triceratops and Tyrannosaurus Rex. Unlike today, however, ants played a relatively small part in the biosphere of the time and equate to just 1% of all fossil finds becoming much more successful about 60 Million Years Ago after which period approximately 20% of all insect fossils are ant species, some of which are still alive today. Since the New Jersey discovery, cretaceous ants have been found in locations as diverse as Canada and Myanmar. Working together Ants can be extremely destructive. 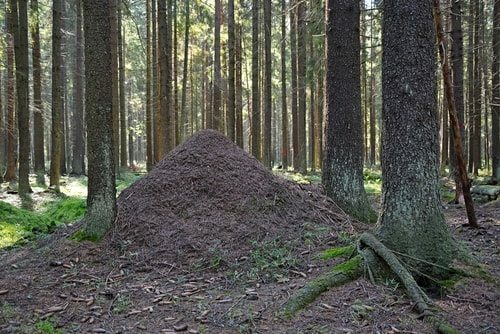 While ants are tiny they can almost literally move mountains as they are capable of moving approximately 50 tons of soil every year in just one square mile. This is fine if they stay where they are meant to be but if they come into contact with humans and human habitats they can cause havoc. Red Imported Fire Ants are a foreign species that has flourished in the USA. Originally confined to Texas, Oklahoma, California and the South East they have started to spread into more and more states. The FDA estimates that they are responsible for causing more than $5 billion in damage repair, medical and control costs every year and a further $750 million in agricultural losses. Fire ants have a painful bite that can be very dangerous for people and pets who have an allergic reaction to it. A fire ant colony extends a long way beyond their mound which will have foraging tunnels leading from it for up to 100 feet. 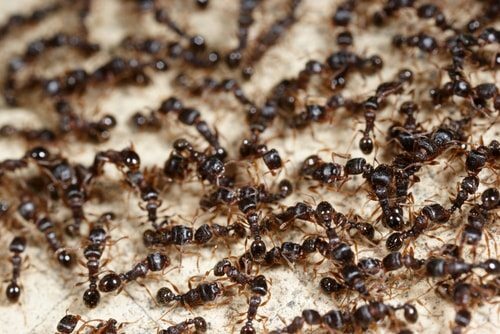 It is not just Fire Ants that cause damage, Carpenter Ants can become a problem if they nest in wooden structures while Crazy Ants are known to cause over $145 million of electronic damage every year. Their behavior is unpredictable and they are known to destroy laptops and other small electronic devices as well as enjoying a nibble on the feet of livestock. They require repeated, expensive treatments to keep colonies under control. 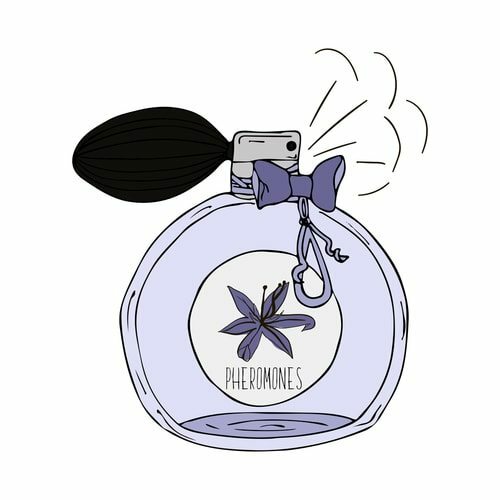 Ants use pheromones (scent chemicals) to communicate with each other. These are secreted from special glands found all over the ant’s body. Other ants use their antennae to detect and decode the message that the pheromones are sending. Depending on the species, ants are capable of producing up to 20 different pheromones, each of which sends out a specific signal. Ant society is highly stratified and organized (see below) and some ants will be designated as ‘scouts’. It is the responsibility of these scouts to search for food by wandering somewhat randomly until they encounter a suitable source. They are required to perform some significant and impressive feats of navigation because once they have found the food they return straight to the nest leaving a trail of pheromones to connect the nest and the food in the most direct line. The worker ants are then able to follow the scent trail directly to the food. As they wander along the trail between the food and the nest they lay down more pheromones to ensure that the trail is well marked. Ants have a fascinating biology. They have evolved two stomachs, one to house the food they themselves will use for nutrients and another, called a crop or social stomach used to feed other ants. This adaptation was developed to allow some ants to stay behind to guard the nest without starving. In a process known as trophyllaxis worker ants who have been foraging for food will ‘kiss’ the nest ants and, as they do so, regurgitate food into their mouth. While all ants do this, Honey Pot Ants have developed an extreme form of trophyllaxis. Workers called ‘repletes’ are used as larders for the colony. They are fed so much that they swell up so much that they are not able to leave the nest. When food outside the nest is scarce they return the favor and feed the other ants. These repletes are so full of nutrients that they are an excellent food for humans and other animals. As if turning your pals into living larders were not bizarre enough some ant species go even further. One species of ant, Mycocepurus Smithii, has done away with males all together. The queen ant reproduces by creating clone daughters. So entrenched has this form of reproduction become for them that the species has lost an essential part of their reproductive system. They are now completely unable to mate and are the first ever species to be discovered to reproduce entirely asexually. The ant species are farmers, and grow a wide variety of different fungi as crops which also reproduce asexually. It is a weird world! Ant colonies can be gimongous. We have already mentioned that there are so many of these tiny creatures in the world that their total biomass exceeds that of the number of humans currently living on the planet (see above) and mentioned that there are huge numbers of different ant species (over 1600 when including sub-species) with many more waiting to be discovered. As a result of these huge numbers ants are capable of colonizing impressively (some might say frighteningly) large areas. One particular species, Argentine Ants, are so widespread that it could even be said that they have taken over the world. As their name suggests these ants are native to South America but have been spread around the world forming three super-colonies. In Europe a single colony has been measured as spreading for 3,700 miles, a Californian based colony covers over 560 miles and there is another large colony in Japan. Ants can distinguish other ants belonging to their colony by the pheromones that they secrete and will typically refuse to fight a ‘related’ ant. 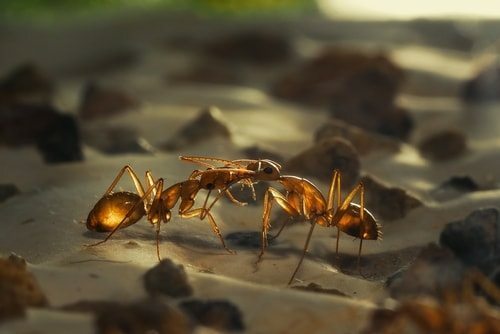 For a long time scientists thought that the super colonies of Argentine Ants were separate from one another but, studies have shown that they are all related to one another and the ants treat each other as members of the same family even though they were born thousands of miles apart on different continents. Argentine Ants in smaller colonies still retain their natural aggression to other colonies so what allowed the connected super colonies to form? No one quite knows why but we do know how. Princesses lose their wings at birth and, instead of completing a mating flight, they mate instead with workers or drones meaning that their offspring are all identical to the original colony. The only other animals to have formed similar connected (although not genetically identical) societies on this earth are humans. Ant colonies have clearly defined roles. Ants have an extremely complex social hierarchy which is headed by a queen. There are three castes within ant society. Queens and Princesses are winged and fertile females. Workers are infertile females that perform a number of different roles including nannies, soldiers, workers and scouts. Finally there are a small number of male ants who also have wings, they are vastly outnumbered by the fertile and infertile females and are almost never seen by humans. Once the winged ants are developed and sexually mature they will fly away to mate. Males die after their one and only mating flight while queens might try to mate with a number of different males and will store the sperm from all of them. After their mating flights queens will establish a new colony. Once comfortable at the center of the colony she will remove her wings and spend the rest of her life (they can live for up to 15 years) laying eggs. The queen is capable of deciding whether an egg will become male or female by fertilizing them. Eggs fertilized with sperm develop into females while the unfertilized eggs become male ants. The queen is further able to decide whether a fertilized egg will develop into a princess or a worker by choosing what nutrition the eggs receive. The first eggs to hatch after a mating flight will almost always be sterile workers and they will be used to build and expand the colony. Ants are fabulously strong; able to lift weights many times in excess of their own, they have also proved themselves tough enough to colonize almost every corner of our planet. 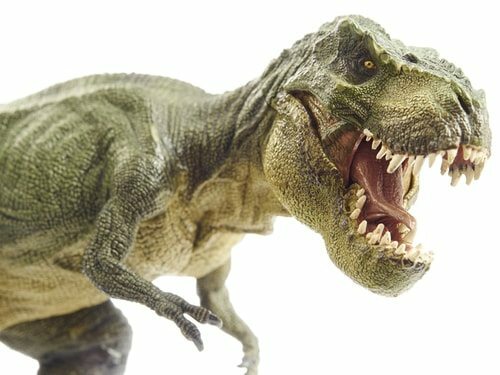 These tiny little creatures were around when dinosaurs roamed the earth and managed to survive one of the most catastrophic extinction events of all time. We can learn an awful lot from these clever insects. Ants developed agricultural techniques around 70 million years ago before our earliest known ancestor, a lemur type creature known as Ida (dated to 47 Million years ago) even existed. Australopithecines, the earliest humans only came on the scene around 4 million years ago while anatomically identifiable humans developed only 200,000 years ago and invented agriculture 12,000 years ago. A blink of an eye in terms of ant history! Ants are able to perform feats such as agriculture because they are able to communicate (through pheromones) and co-operate. Their strictly hierarchical society means that everyone has a job to do and does it willingly. 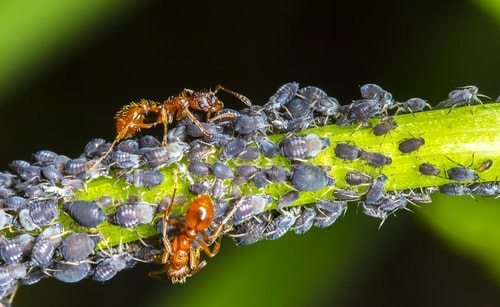 They have, over the millennia, developed strong, effective, symbiotic relationships with various different species and they willingly feed each other to ensure that the colony can be protected and no ant goes hungry. There are downsides to ant culture, however. They are known to be quite hard task masters to the animals that they farm, going so far as to clip their wings and preventing them from escaping. Some ants exploit other ant species as slaves, working them to death and preventing them from reproducing. Others have done away with males completely to create a completely alien form of society and life that relies completely on cloning. Whether your think they are admirable or creepy there is no getting away from the fact that ants are one of the most interesting of insects.